In November, I participated in a Q&A about emergency response to help you better understand effective emergency response planning, what emergency preparedness looks like for Blackline employees and how processes can be modified based on weather conditions. The aim of this article is to expand on emergency response and how it relates to the current state of the corporate safety industry. I hope you find this information revealing and helpful in managing your emergency response going forward. Risk exists throughout the workplace, because an injury, health event or assault could occur at any moment. Every employee faces some level of risk; however, the most vulnerable workers are those who work alone. Being able to respond in a timely fashion is critical to deliver emergency assistance to a worker in need. Through proactive emergency preparedness planning, any organization can evaluate its capability to respond to a broad range of situations and events that may occur in the workplace. An effective emergency response can be objectively measured. The overall emergency response time is a critical factor that influences an organization’s ability to make a difference. The clock starts at the onset of the safety incident and ends when responders are on-site, providing valuable assistance. The challenges most organizations face are two-fold—knowing when an incident has occurred and where to direct the emergency response. 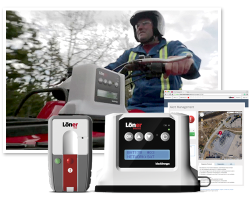 Ideally, monitoring personnel are notified in real-time that an incident has occurred and technology provides the situational awareness to direct responders to the employee’s exact location. Such an approach helps the employer manage the most efficient response possible. At Blackline, it’s our role, as part of an overall emergency response program, to provide technology that monitors employee safety in real-time, automatically engaging with monitoring personnel when an incident may have occurred. This technology can indicate which employee may need help, the potential incident type, his or her precise location and whether co-workers are nearby and can be the first responders on the scene. With our solutions we can send help to your employees located in some of the most hard-to-reach locations in the world. And it’s our ability to send help anywhere that offers assurances to our customers that help is on the way, if and when a safety incident occurs. When coupling our work-alone safety monitoring technology with our in-house 24/7/365 Safety Operations Center, customers get a response to work-alone incidents that is fast and effective.